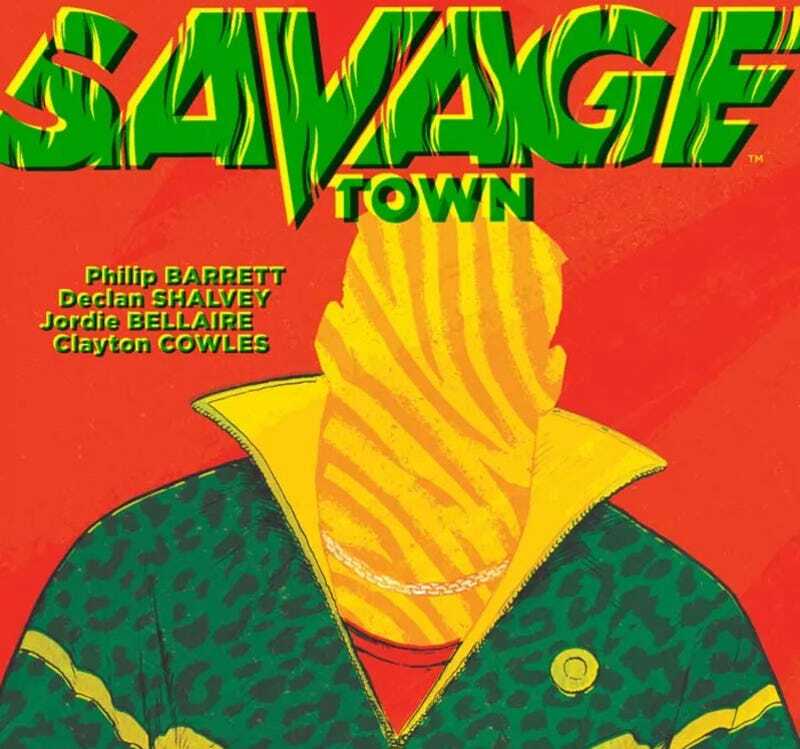 Savage Town (Image Comics) fancies itself a pulpy crime yarn—in fact, it’s so in love with the idea of itself as an urban crime novel that it forecloses the possibility of being anything, or including anything, else. The work is positively debilitated by this self-delusion, and it makes for a plodding, repetitive experience. As a result, the book, which cartoonist Chris Samnee describes in a blurb as “one hell of a page-turner,” is anything but. Written by Declan Shalvey and illustrated by Philip Barrett, the book concerns the criminal dealings of Jimmy Savage, though, what those dealings are exactly is never quite clear. There is so much going on (and every plot point is introduced so cursorily) that you can never be quite sure who is who and how their interests align with or oppose the interests of various other characters. But fortunately, things are resolved quite neatly, or, as the book’s postscript puts it: “Savage stuff, sham. At least evertin’ werked out in de end.” But this narrative discombobulation really only serves to underscore the real problem with the book; namely, that there isn’t anything but plot. Every scene, every line of dialogue, every fleeting glance serves to advance the plot. So when you knock firmly on that edifice and that particular thunk of a hollow interior greets you, there’s simply nothing else to buttress that dissatisfaction—not character, not atmosphere, not even cheap melodrama. But while this plodding, forward perseverance of plot might give the impression that the book moves with some verve or energy, the opposite is actually true. Because of its arrhythmic pace, reading Savage Town is a particularly grinding experience. Ultimately, however, the greatest sin that Savage Town commits is its page count. 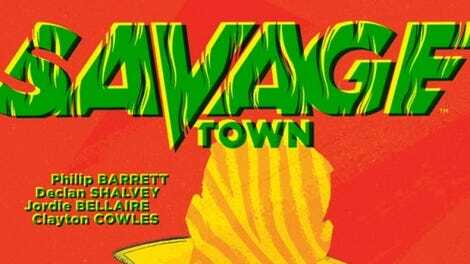 For all of its condensation and succinctness, Savage Town is not particularly constrained by page limits or some artificial arbiter of its scope. The narrative ends and the book continues on for nearly 25 pages, collecting sketches, preliminary work, and process material—all space that it could have used to flesh out or spice up its endlessly repetitive pacing. Because of its constant, quasi-picaresque roving through its urban locale, the book almost works as a portrait of its setting, Limerick City. Barrett’s linework, at its finest moments, evokes Steve Dillon (who the book is dedicated to) and Gilbert Hernandez, and he manages to bring a significant amount of texture to the spaces, streets, and interiors of the story. Through Barrett’s work, which is significantly aided by colorist Jordie Bellaire (who does a praiseworthy job lighting the book’s night scenes), readers are able to approach the city as a character unto itself. But even that approach is waylaid by the book’s relentless drive to reach its conclusion. It refuses to spend enough time in one location long enough for Barrett’s work to really take hold. The result is a work that is striking in its poverty, and grueling in its engagement.